Mysore Dasara, starting September 29, is a Dasara celebration where divine fervor meets royal splendor! The Wadiyar couple celebrates this 10-day festival with pomp and grandeur and the city celebrates with them. The festival is steeped in religious history. Goddess Chamunda killed the demon Mahishasur. After his death, the city acquired the name of Mysuru ( Mysore). Devotees built a temple for Chamundeshwari. Today, the festivities begin with the Wadiyar royal couple offering prayers to this goddess, followed by a special durbar (royal assembly) and many other cultural events. On the 10th day (Vijaydashmi), a spectacular procession is held. Around 100,000 bulbs illuminated the royal ​Mysore Palace alone — and many more were used to light up the rest of the city during Dasara. ​The festival draws huge crowds. Lots of tourists came to the palace to see the Mysore Dasara. ​The tradition of "holding court"
King Krishnaraja Wodeyar III began holding a special Durbar (court) as part of the festival celebrations and the tradition exists to this day. ​Raja Wadiyar inaugurated the Dasara Festivities. The royal family has celebrated the festival ever since. The records of the Persian ambassador Abdur Razzaq contain descriptions of Dasara celebrations in Mysore during this period. The main attraction is the idol of the goddess Chamunda — placed on a gold mantapa that weighs 750 kg. She moves in a grand procession with dancers, musicians, floats, and elephants. The spectacular Mysore Palace becomes even more beautiful as it is lit up during Dasara. Musical performances, dances, handicrafts, jewelry, and more! There is a lot to discover (and places to shop) in Mysore during this 10 day festival. 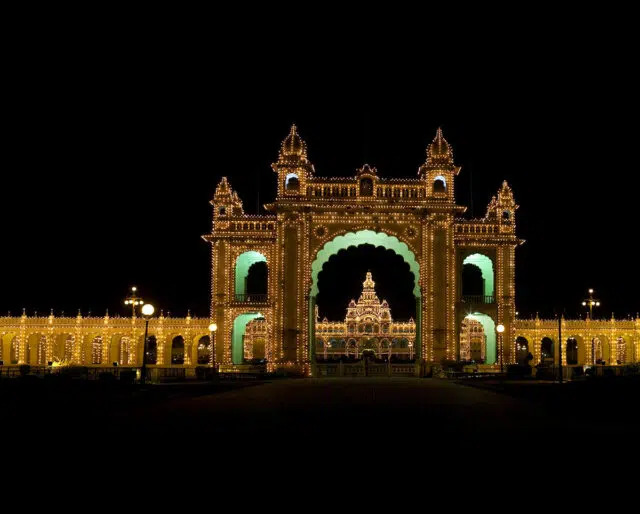 ​Not just the royal Mysore Palace, but the entire city is lit up for a dazzling display during the festival. A riot of colors, sounds and displays treat the senses. The procession includes musicians, dancers, and an elephant carrying the idol of the goddess. ​This is a great time to discover the rich cultural heritage of India as performers and artists flock to Mysore to take part in the cultural festival and fairs. ​Once a year, the Golden Throne is taken out of storage and put in the royal Durbar Hall for public viewing. ​Helicopter rides, a 3D projection of the royal palace, and hot air balloons — you can enjoy all that during Dasara too! For the past 400 years the royal Wadiyar family has been celebrating this festival and organizing events for the public and tourists. The city comes alive with events like cultural programs at the palace, food festivals, fairs, flower shows, and events for children. All over India — Dasara is celebrated with great religious fervor and people of all religions enjoy the cultural festivities.